The last time I wrote about Cecilia Noël was in 2011. Click here to visit that post and see/hear some excellent handpicked live concert films of Cecilia Noël and The Wild Clams. Cecilia Noel is looking younger and more vibrant as time has gone on. World travel and dancing with The Wild Clams does wonders! Her band travels and performs far and wide. 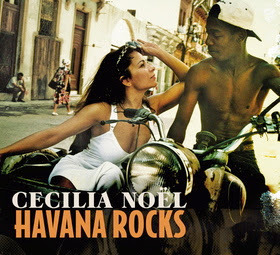 For quite some time now, Cecilia has made Cuba a regular destination.